Coastal Travel Vacations believes in the regenerating power of vacation and the bonding effect it imparts to families and all sorts of relationships, including our relationship with ourselves. A business opportunity was constructed to reward like-minded individuals who are interested in investing themselves into the sale of travel memberships. Coastal offers memberships in a Vacation Club, and a business opportunity to refer others to the Vacation Club in exchange for compensation. Our compensation plans range from $1,000 up to $9,705!! There are many advantages to owning any type of business. If you are still with me then let’s explore the many advantages of partnering with Coastal Travel Vacations, also known as becoming an Independent Business Owner. We will introduce you to those in this article. Before we begin let’s briefly review the notion of network marketing. Just as all computer companies or biotech companies are not alike, network marketing companies are not all alike and they span many different industries. Vitamins and wellness, health and beauty aids, juice, skin care products, household cleaners and the list gets longer every day. Wikipedia defines a network marketing company as one in “which the sales force is compensated not only for sales they personally generate, but also for the sales of the other salespeople that they recruit”. So this concept implies that if you build a strong sales organization and continue to train, grow, mentor and support your team then leveraging this model can have a multiplicative effect on your earnings. Coastal has one of the most dynamic compensation plans in the network marketing industry. The beauty and simplicity of the business is the fact that the product is a membership. Additionally every time a membership is sold, the director is paid immediately, directly from their customers. This is known as instant income. In order to be an Olympian you have to train. In order to master any sport or craft or any endeavor, you have to be committed to, (and have available) rigorous, ongoing training. Coastal provides state of the art training opportunities to our Directors plus one on one training with your very own Mentor – your Director. Coastal provides all directors with access to a replicated website. This means a Coastal website with your name appended at the end of the website. This provides a complete brand for the director and offers validity to the opportunity being presented. Travel is a booming business and one that is still riding a positive growth trend. Travel and Vacation are global enterprises as people are constantly and continuously moving from place to place for a variety of reasons. If you add to this the fact that the business itself can be done from virtually anywhere you have many compelling reasons to seek more information about the business opportunity with Coastal Travel Vacations. 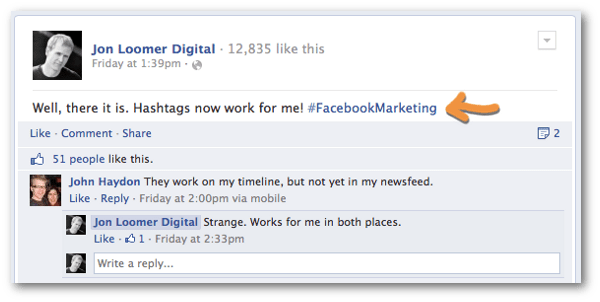 Facebook Hashtags for Brands: What You Need to Know! this. Everyone else will need to get up to speed. what I see. You’ll see all public conversations and those the author allows you to see. going to be confused. If every other word is a hashtag, it’s going to be annoying. won’t get the positive response you’re looking for. will enhance your post. If you are thinking about your business first, it will be a distraction. If your post is about a single topic, create or use a hashtag related to it for further discussion. It must be relevant. Understand that if your post doesn’t add value, you are simply adding noise to that hashtag’s stream. And the hashtag itself adds noise to your post. It needs to be something that is easy to read and remember. Avoid slang and hard-to-spell words. 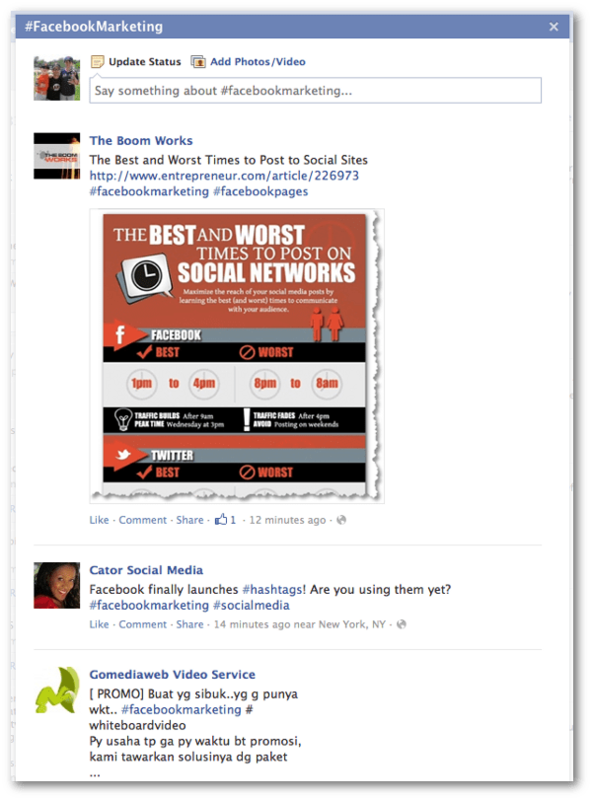 between #fbmarketing and #facebookmarketing. Or #fbads and #facebookads. Use the hashtag that makes the most sense. If you want to create a conversation, keep it unique. If you want to join a conversation, use a popular one that is relevant. Don’t use spaces or special characters in your hashtag. The linkable portion will stop before that character. The only exception is the underscore (“_”). While using capital letters will make your hashtag easier to read, they aren’t case sensitive. I fully expect most brands to latch onto the most popular hashtags. The goal will be Reach. They will be abused. And those streams will be spammed like crazy. filled with spam and irrelevant content? You wouldn’t. own content under a hashtag or to reach a very specific group of users with your content. How Are You Using Hashtags? hashtags for your brand. How will you be using them? Work With Me Directly, Click Here!! Little Ticket To Wealth – Great Way to Market Your Coastal Travel Business!! Cool concept right? or they can also make money with their own “Lead Business” by offering the 63 Million worldwide, frustrated Internet and Network Marketers a way to advance their business? The Secret Lead Factory is the marketing system behind Little Ticket To Wealth and is where you can keep track of all your leads, change your opt-in video page, also manage all the preloaded auto-responder messages to follow-up with your leads and is in my opinion worth every cent of the optional one-time cost of $69. The point is to send your leads to the Secret Lead Factory marketing system so they can opt into your capture page and view the 14-minute video that does all the selling and explaining. What Makes Little Ticket To Wealth Different ? I could bore you will all the details about how fast Little Ticket To Wealth has grown to have thousands of happy members from around the world or i could also tell you about how Little Ticket To Wealth is in it’s third year, which is kind of cool. But what really matters to people like you and me, are the LEADS!!!. owner needs and that’s leads. With Little Ticket To Wealth you’ll receive and supply an endless flow of Leads to MLM and Direct Marketing Businesses Leads and also earn Endless Instant Commissions paid direct to you from $100 to $400. Product 1: 200k leads a month + 2000 Buyer leads per month for a ONE TIME $200 and $20 per month. WOW! Product 2: 100,000 leads and 500 buyer leads per month for a one time $100 and $10 per month. ** (NEW) Product 3: 400,000 leads + so much more including SMS Leads per month for a one time $400 and $40 per month. The BEST Part.. this level comes with a FREE Emailer system for you!! Do you want quality leads month after month? Do you want to know what is working right now to build high ticket direct sales opportunities and Network Marketing programs alike? QUESTION: Give me a reason as to WHY I should join Little Ticket To Wealth right now? ANSWER: Okay, I’ll do one better than that. 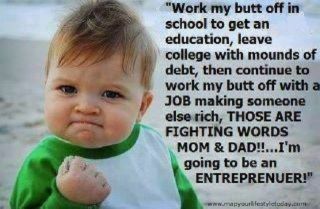 I’ll give you THREE solid reasons why you’d be foolish to pass up a program like Little Ticket To Wealth. Reason #1 – Little Ticket To Wealth is a NON COMPETITIVE program. Meaning, it fits hand-in-glove with just about other income opportunity type of program. It’s the perfect COMPLIMENTARY opportunity because it gives you a 2nd chance to collect a YES from your prospect! Reason #2 – With Little Ticket To Wealth’s Instant $100 – $400 Per Sale (after qualification) you don’t even need a primary program. You can easily see 6-9 sales per week to start just by offering Little Ticket To Wealth to the millions of starving networker who need access to quality leads, tools and the right training. Think of it like this… They’re gonna buy leads, tools and training from someone… may as well be from YOU! Reason #3 – Your prospects will inevitably ask YOU how and where to get leads. You can easily refer them to Little Ticket To Wealth as a source for leads as well as a 2nd income stream OR if they join you in your primary program, you could give them a comped position in Little Ticket To Wealth as a BONUS for joining with you. And, it also makes gathering customers as simple as asking those in your current social network how much money they are currently spending on Lead Generation and then offering them substantial savings with Little Ticket To Wealth. Click Here to get more information today!! ps. Prefer Travel? Click here! Coastal Travel Vacations Club and the Benefits of a Travel Club Membership! The Internet consists of an affiliation of businesses and individuals who work together for the profit and benefit of all parties involved. Such is the case with the online travel industry and wholesale travel clubs like the Coastal Vacation Club. Groups of individuals running their own travel businesses work together as part of a consortium or club that uses a variety of vendors or sources for information and online bookings. These online travel clubs are your best source for discount week-long condo stays, Carnival & Royal Caribbean Cruises, airfare specials, hotels,and Golf packages. Though the individual sites are not connected, and independently owned they use the same strategies and often go through common vendors to obtain discounts and other benefits. Each person who runs their own business was trained by the central agency and a team of directors. discount vacation membership, they earn money. Considering the boom and appeal of discount travel, income potential in this industry can be quite high. Some business owners use it as a source of a little extra money, others find that they can earn a very nice living with minimal effort. The second benefit to business owners is discount travel rewards. Members can take advantage of the club’s discounts on their own travels. Since most people who go into this line of work are already passionate about travel, this is a very nice bonus. People are typically able to save up to 75 percent off their own vacations. The third benefit to business owners is that they can offer travel rewards and incentives to their best customers and employees. Retail business owners love to give away 2 night 3 day get-a-ways, plus cruises on Carnival or Royal Caribbean, or week-long condo stays.